USS BAILEY (DD-492) arrived at Kodiak Alaska 28 September 1942 and received her first permanent assignment as part of Task Group 18.6 which had as its flagship the cruiser INDIANAPOLIS (CA-35). The composition of TG 18.6 varied over the coming months but its mission remained the same, patrol the Aleutian Island area, protect friendly forces on occupied islands, and intercept and destroy enemy shipping attempting to reinforce enemy bases on those islands. 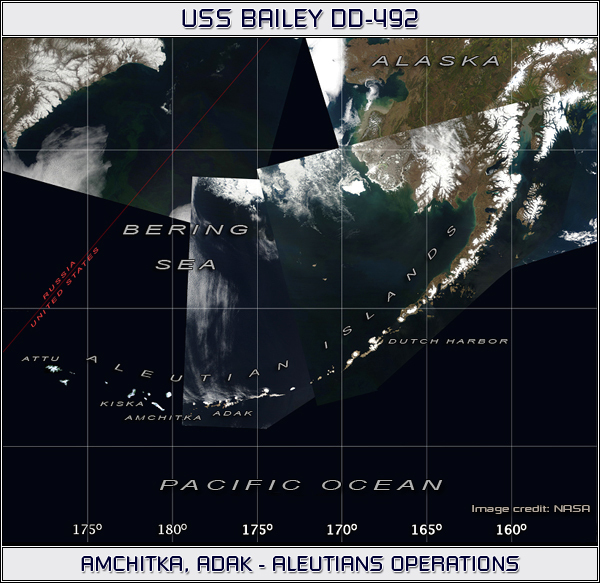 Indicative of these patrols, in an area northwest of Kiska as a component of a raiding group that included USS NASHVILLE (CL-43), USS ST. LOUIS (CL-49), USS BANCROFT (DD-598) and USS LONG (DD-209) BAILEY steamed for a period of 16 days the only contact being a lone Russian merchant vessel. On 12 January 1943 as part of a task group that included USS RALEIGH (CL-7), USS DETROIT (CL-8), and USS INDIANAPOLIS (CA-35) she provided cover for Army forces as they were deposited on the beaches of Amchitka Island in the first attempt to remove enemy forces from American soil. The task group served for six months in the most inhospitable climatic environment of the war often required to steam continuously for days in the Williwaw winds that could reach well above 100 knots and produce seas swells of 70 feet or more. Through the Winter of 1942-43 no opposition was met during the patrols or at Amchitka but soon enough BAILEY would play a critical roll in repulsing a superior Japanese force during the last all gun battle in United States naval history.